You are a great event rental business owner. You treat your customers well, your equipment is in good shape and your employees are happy. So, what more can you possibly do to grow your events business? Well, the good news is that you’re already doing all the hard work! The simple answer to “how can I grow my business?” for nearly all rental businesses is digital marketing. Nearly 70% of global internet traffic comes from mobile devices. Social media is becoming a step in the consumer decision-making process. The main point we will try to get across in this blog post is that most event rental business owners are not digital marketing experts and therefore tend to avoid the conversation, which leads to missed opportunities. We understand that digital marketing can be intimidating, so we will keep this blog post nice and easy. Here are five easy ways to grow your rental business with digital marketing. 1) SEO (or Search Engine Optimization). Don’t let the name intimidate you. 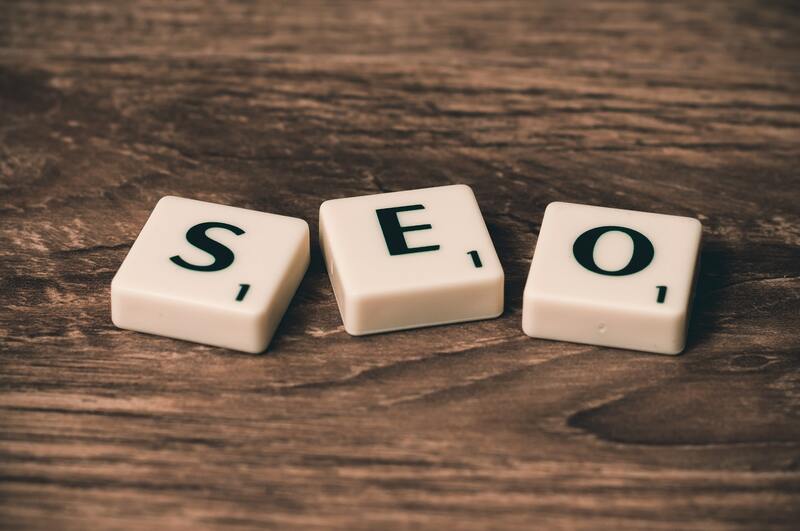 Let’s break down SEO. Simply put, SEO = Search Engine (Google) Optimization (the action of making the most effective use of a resource). So, in other words, SEO is the art / science of creating a website that drives the most value from Google. Imagine ranking #1, 2, or 3 in a Google search for each of these terms. That would result in free visits to your site that ultimately turns into customers. Total cost of acquisition (COA)? Basically $0. In a nutshell, SEO is like planting a tree. It may not bear fruit immediately, but once the tree matures, it can become a free source of food for decades. 2) Customer Reviews. 93% of consumer purchase decisions factor in reviews. Get reviews on Google, Yelp, The Knot, Wedding Wire, etc. Want proof? 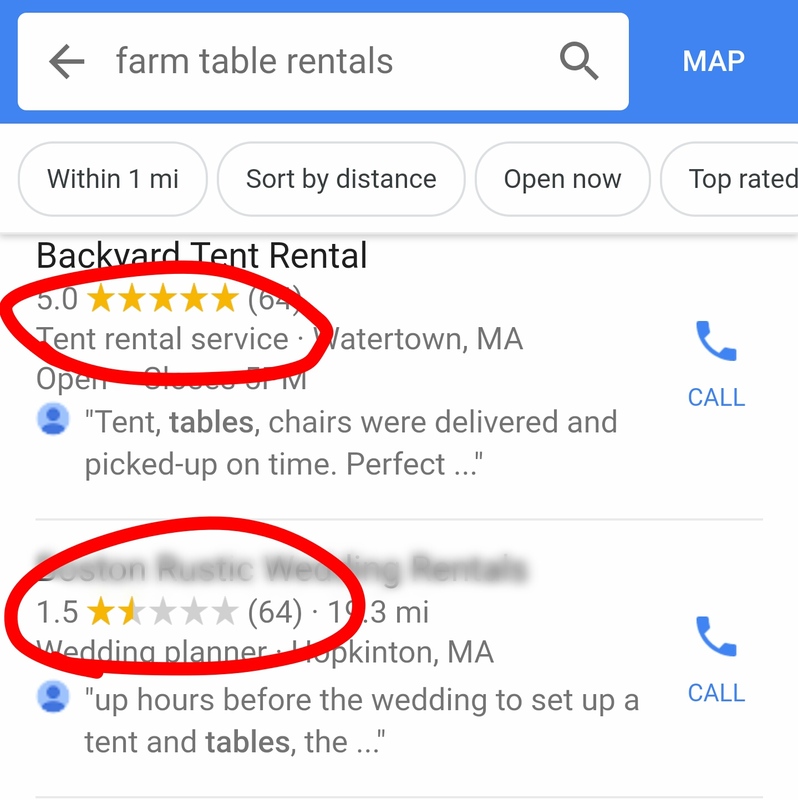 Here are two businesses, side-by-side, with the exact same number of reviews… which one would you call? While it is discouraged to reward customers for leaving favorable online reviews, there is absolutely nothing wrong with reminding customers that you appreciate reviews. After a rental, ask customers for a review! Over time your reviews will start to do the “selling” for you. Google My Business (seen in the image above) is a free tool and is a perfect place to showcase your reviews, add photos, list your hours and services, etc. 3) Setup (and actually use) web analytics. 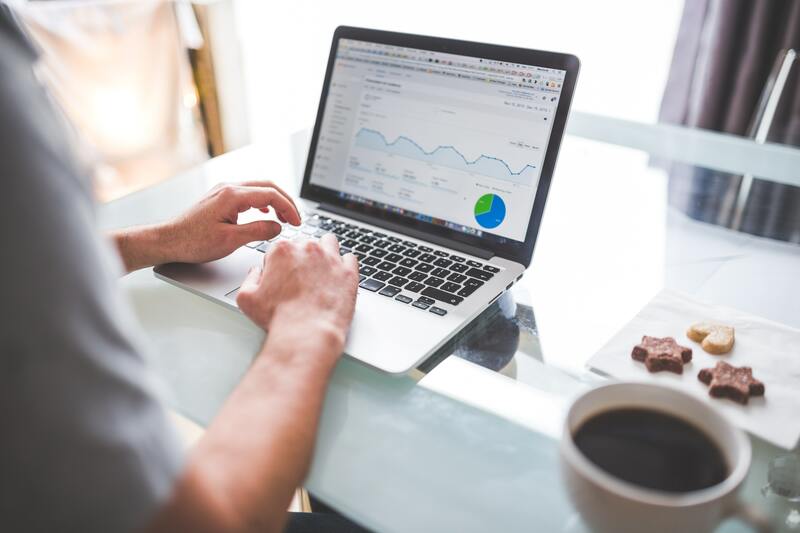 Web analytics tools like Google Analytics gives business owners incredible insights into what is happening on your website. You will learn how visitors came to your site, which pages are most popular, why do visitors leave, etc. You can’t learn if you don’t measure and track. Here is the easiest example of how analytics can help businesses grow and improve. [Example] You budget $6k for advertising. $2k with Google Ads, $2k with Yelp and $2k with your local online newspaper. [Without analytics] You have no clue which form of advertising worked best, so you just do the same thing again year after year. [With analytics] You can easily see that Google drove 15 leads, Yelp drove 5 and the local online newspaper drove 1. So, next year, you take your $6k budget and spend it entirely with Google, which then drives 45 leads. Congrats, you just grew your business without lifting a finger. 4) Email Marketing. New customer acquisition is key, but repeat / referral business is an incredibly cost effective way to grow. Famous investor Warren Buffett offers a great analogy here. Warren once said, [paraphrasing] “I look for discarded cigar butts with one last puff left in them when looking for companies to invest in.” That analogy applies to email marketing. You go through all this trouble to acquire new customers, don’t just discard them like used cigars after you’ve done a job for them. Instead, make sure you maximize the value of each customer, starting with your past customers. Your customer list is a valuable asset. You can setup email campaigns and blast your customer base to fill gaps in schedule, announce new products / services, and keep / retain your customers before they think of using someone else. Once you've created an email marketing plan, you can set it on auto-pilot and run it year after year. Tools like Constant Contact are user-friendly, simple, and inexpensive ways to grow your business by marketing to your past customers. 5) Social Media. Yes, you've heard about using social media to grow your business 1000 times already, but think about all the ways a healthy social media presence can grow your business. The Halo Effect. getting exposure to your followers' followers by tagging / mentioning them in posts. Showcasing your work. It’s so easy to snap a pic and upload to instagram. So, use social media as a simple way to show off your latest work and to give your customers some ideas / inspiration. You can pull your photos straight from the Quality Assurance photos you have your employees drop into Goodshuffle Pro. Stay top of mind. If you're a party rental business, use social media to remind people to book their thanksgiving seating / flatware today. Or remind people that Passover is coming and they need to place their rental order soon, etc. Social media marketing is a free, easy way to communicate with your current customers and prospects, and it’s increasingly becoming an important step in purchase decision-making. You don’t have to be a social media expert, just be authentic, learn some best practices and your fans / followers will come. About the Author: Jim Mariano is the President of Recipi. Recipi is a digital marketing agency that exclusively services rental businesses. 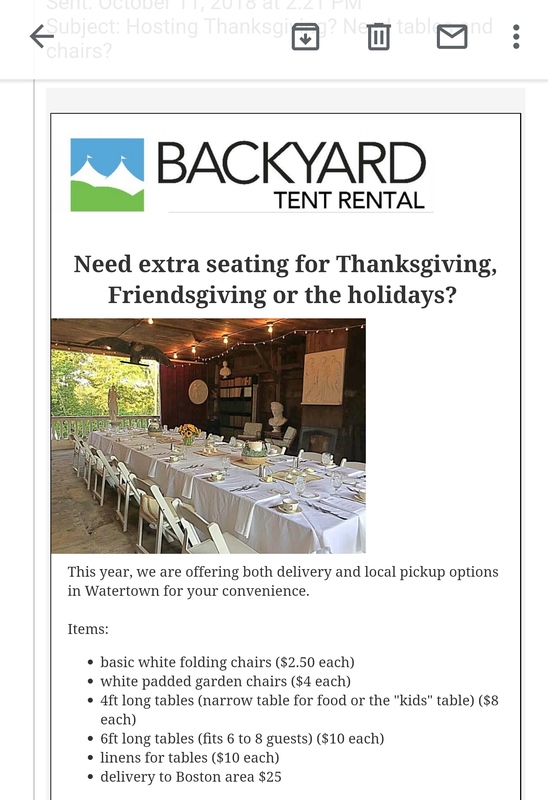 Jim has owned “Backyard Tent Rental,” a tent rental business in the Boston area for 13+ years and brings over a decade of digital marketing experience working in software / tech. 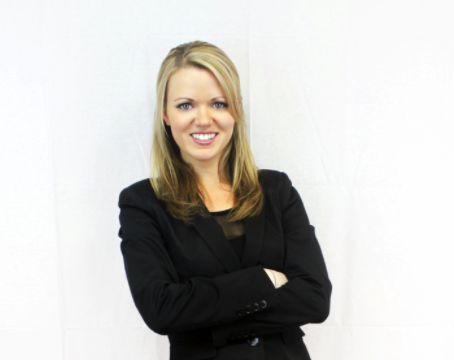 About Recipi: Recipi helps rental businesses grow with digital marketing. Recipi’s team consists of digital marketing and rental business pros who have helped dozens of rental companies improve their digital marketing and compete in today’s digital marketplace. Go to Recipi.com for more info.